Fisheries officers rescue tangled whale off central B.C. 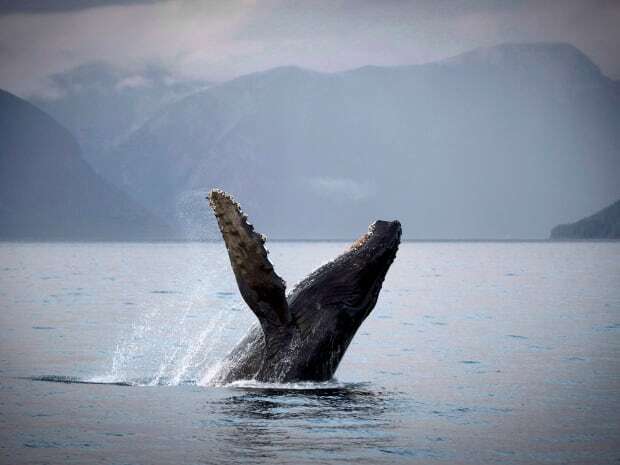 The Canadian government is downgrading the protection of humpback whales off the coast of B.C. under the Species at Risk Act. The move is being made as the government readies for a decision on the approval of the Northern Gateway pipeline, which would feed oil onto a tanker shipping route that overlaps with what environmental groups describe as "critical habitat" for the whale. Environment Minister Leona Aglukkaq, with advice from Fisheries Minister Gail Shea, is recommending that the Northern Pacific population of humpback whales be downgraded from "threatened" to "species of special concern." The recommendation for the change to the Species at Risk Act was published in the Canada Gazette Saturday. The government is accepting responses to the recommendation for 30 days following publication. After that, the change would go into effect immediately once approved by the Governor-in-Council. PHOTOS: Humpback whale to lose 'threatened' status in B.C. There would no longer be a requirement to protect the whale's critical habitat. Other "general prohibitions" under the act would no longer apply. In a statement supporting the recommendation, the government noted that the whale population has increased "significantly" since it was first listed as threatened in 2005. It added that a 2011 assessment by the Committee on the Status of Endangered Wildlife in Canada (COSEWIC) showed the whale's population growth rates have also increased to the point where it can be reclassified as a species of special concern. COSEWIC is an independent scientific body designated to determine the level of threat to a species and its classification under the Species at Risk Act. Andrew Trites, research director at the University of British Columbia’s North Pacific Universities Marine Mammal Research Consortium and a member of the COSEWIC committee that studied the whales, said the recommendation was made by biologists, not politicians. “This is actually a good news story,” Trites told CBC News. Trites said the whale population is increasing at about four per cent each year, which he called “phenomenally fast” for a whale population. Still, he cautioned there may be threats to B.C.’s whales in the future, including collisions between whales and oil tankers. He said COSEWIC is keeping an eye on the whales, and said if there are problems in the future, the endangered status of whales should be reassessed. For now, however, Trites considers problematic interactions with boats a “hypothetical” that should not affect the decision to downgrade the whales to a species of special concern. “We can only change things that are real,” he said. The government held consultations in 2011 on the proposed change to the humpback whale's status, based on the COSEWIC report. At that time, it noted, a majority of responses were against changing the whale's classification. Fisheries and Oceans responded to concerns by saying that the resulting reduction of protection wasn't expected to affect the whale's population growth rates, and that the Fisheries Act and Marine Mammal Regulations would continue to apply. The government noted that the whales continue to receive protection within the 3,400 square kilometres of Gwaii Haanas National Marine Conservation Area Reserve, which has been identified as "a primary feeding habitat" for the whale in the waters off the west coast of Canada. It added that the downgrade "could result in small benefits to industry in the form of cost savings." Under the new status, the government still needs to come up with a management plan for the whale, including conservation measures, within three years of the change in classification. The population and distribution of the whale would still need to be monitored, and reports would have to be issued every five years. Karen Wristen, executive director of the Living Oceans Society, said the decision to downgrade the whale's protection "has absolutely no basis in science and is simply a political move to clear the way to approve the pipeline." She noted that downgrading means that the government would no longer have to designate critical habitat for the whale's recovery. Currently, that designated critical habitat includes areas near Kitimat, B.C. – the proposed western end of the Northern Gateway pipeline – where the whales feed and rear their young in the spring and summer, she said. The federal government is expected to decide before the end of June whether to approve or reject the proposed pipeline. A report of a joint review panel recommended in December that the government approve the project subject to 209 conditions. If the pipeline goes ahead, the whales' feeding and breeding areas are expected to be a major corridor for oil tanker traffic. "Ships were one of the specific things that were mentioned by …scientists as being a very high hazard to the whales for their recovery," Wristen said. "The danger is of course that the ships will strike them physically and kill them." Scientists involved in the recovery strategy for the whales also cited the potential for the whales to be harmed by toxic oil spills. There are also concerns, Wristen added, that noise generated by ships would disrupt the whales' feeding and their ability to care for their young. "Without the habitat, they can't be expected to thrive," she said. Wristen said while the population of whales has increased since they were protected from hunting, it's not clear how current populations compare to population levels before hunting began. Scientists are also in the process of researching whether there are several distinct sub-species within the whale populations that need individual protection in order to maintain a healthy level of genetic diversity, Wristen said. The government noted that COSEWIC was asked to consider whether there was more than one sub-population of whales, but in December 2013, it found "no clear evidence" supporting that idea. In January, the Living Oceans Society, along with Ecojustice, ForestEthics Advocacy and the Raincoast Conservation Foundation, launched a lawsuit attempting to block cabinet approval of the pipeline. They argued that the report being used as the basis for approval was flawed, in part because it failed to consider protections for the humpback whale required under the Species At Risk Act.